Hans Christian Andersen (/ˈhɑːnz ˈkrɪstʃən ˈændərsən/; Danish: [hanˀs ˈkʰʁæsd̥jan ˈɑnɐsn̩] ( listen); often referred to in Scandinavia as H. C. Andersen; (2 April 1805 – 4 August 1875) was a Danish author. Although a prolific writer of plays, travelogues, novels, and poems, Andersen is best remembered for his fairy tales. Andersen's popularity is not limited to children; his stories, called eventyr in Danish, express themes that transcend age and nationality. Andersen's fairy tales, which have been translated into more than 125 languages, have become culturally embedded in the West's collective consciousness, readily accessible to children, but presenting lessons of virtue and resilience in the face of adversity for mature readers as well. Some of his most famous fairy tales include "The Emperor's New Clothes", "The Little Mermaid", "The Nightingale", "The Snow Queen", "The Ugly Duckling", "Thumbelina" and many more. Hans Christian Andersen was born in the town of Odense, Denmark, on 2 April 1805. He was an only child. Andersen's father, also Hans, considered himself related to nobility. His paternal grandmother had told his father that their family had in the past belonged to a higher social class, but investigations prove these stories unfounded. A persistent theory suggests that Andersen was an illegitimate son of King Christian VIII, but this theory has been criticized by others. Andersen's father, who had received an elementary education, introduced Andersen to literature, reading to him Arabian Nights. Andersen's mother, Anne Marie Andersdatter, was uneducated and worked as a washerwoman following his father's death in 1816; she remarried in 1818. Andersen was sent to a local school for poor children where he received a basic education and was forced to support himself, working as an apprentice for a weaver and, later, for a tailor. At 14, he moved to Copenhagen to seek employment as an actor. Having an excellent soprano voice, he was accepted into the Royal Danish Theatre, but his voice soon changed. A colleague at the theatre told him that he considered Andersen a poet. Taking the suggestion seriously, Andersen began to focus on writing. Jonas Collin, director of the Royal Danish Theatre, felt a great affection for Andersen and sent him to a grammar school in Slagelse, persuading King Frederick VI to pay part of the youth's education. Andersen had already published his first story, "The Ghost at Palnatoke's Grave" (1822). Though not a keen pupil, he also attended school at Elsinore until 1827. He later said his years in school were the darkest and most bitter of his life. At one school, he lived at his schoolmaster's home. There he was abused and was told that it was "to improve his character". He later said the faculty had discouraged him from writing in general, causing him to enter a state of depression. A very early fairy tale by Andersen, called "The Tallow Candle" (Danish: Tællelyset), was discovered in a Danish archive in October 2012. The story, written in the 1820s, was about a candle who did not feel appreciated. It was written while Andersen was still in school and dedicated to a benefactor, in whose family's possession it remained until it turned up among other family papers in a suitcase in a local archive. In 1829, Andersen enjoyed considerable success with the short story "A Journey on Foot from Holmen's Canal to the East Point of Amager". Its protagonist meets characters ranging from Saint Peter to a talking cat. 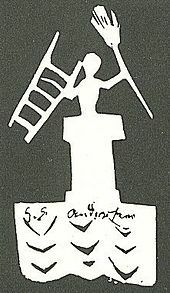 Andersen followed this success with a theatrical piece, Love on St. Nicholas Church Tower, and a short volume of poems. Though he made little progress writing and publishing immediately thereafter, in 1833 he received a small travelling grant from the king, enabling him to set out on the first of many journeys through Europe. At Jura, near Le Locle, Switzerland, Andersen wrote the story "Agnete and the Merman". He spent an evening in the Italian seaside village of Sestri Levante the same year, inspiring the name, "The Bay of Fables". In October 1834, he arrived in Rome. Andersen's travels in Italy would be reflected in his first novel, an autobiography titled The Improvisatore (Improvisatoren) which was published in 1835, receiving instant acclaim. His initial attempts at writing fairy tales were revisions of stories that he heard as a child. Andersen then wrote his original fairy tales. Initially they were not met with recognition, due partly to the difficulty in translating them. It was during 1835 that Andersen published the first two instalments of his Fairy Tales (Danish: Eventyr; lit. "fantastic tales"). More stories, completing the first volume, were published in 1837. The collection comprises nine tales, including "The Tinderbox", "The Princess and the Pea", "Thumbelina", "The Little Mermaid" and "The Emperor's New Clothes". The quality of these stories was not immediately recognised, and they sold poorly. At the same time, Andersen enjoyed more success with two novels, O.T. (1836) and Only a Fiddler (1837); the latter was reviewed by the young Søren Kierkegaard. 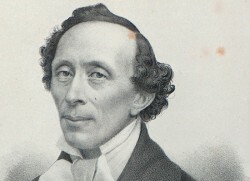 After a visit to Sweden in 1837, Andersen became inspired by Scandinavism and committed himself to writing a poem that would convey the relatedness of Swedes, Danes and Norwegians. It was in July 1839, during a visit to the island of Funen, that Andersen first wrote the text of his poem, Jeg er en Skandinav ("I am a Scandinavian"). Andersen composed the poem to capture "the beauty of the Nordic spirit, the way the three sister nations have gradually grown together", as part of a Scandinavian national anthem. Composer Otto Lindblad set the poem to music, and the composition was published in January 1840. Its popularity peaked in 1845, after which it was seldom sung. Andersen spent two weeks at the Augustenborg Palace in the autumn of 1844. Andersen returned to the fairy tale genre in 1838 with another collection, Fairy Tales Told for Children. New Collection. First Booklet (Eventyr, fortalte for Børn. Ny Samling), which consists of "The Daisy", "The Steadfast Tin Soldier" and "The Wild Swans". The year 1845 heralded a breakthrough for Andersen with the publication of four different translations of his fairy tales. "The Little Mermaid" appeared in the periodical Bentley's Miscellany. It was followed by a second volume, Wonderful Stories for Children. Two other volumes enthusiastically received were A Danish Story Book and Danish Fairy Tales and Legends. A review that appeared in the London journal The Athenæum (February 1846) said of Wonderful Stories, "This is a book full of life and fancy; a book for grandfathers no less than grandchildren, not a word of which will be skipped by those who have it once in hand." Andersen would continue to write fairy tales and he published them in instalments until 1872. Andersen often fell in love with unattainable women, and many of his stories are interpreted as references. At one point, he wrote in his diary: "Almighty God, thee only have I; thou steerest my fate, I must give myself up to thee! Give me a livelihood! Give me a bride! My blood wants love, as my heart does!" A girl named Riborg Voigt was the unrequited love of Andersen's youth. A small pouch containing a long letter from Voigt was found on Andersen's chest when he died, several decades after he first fell in love with her, and after he supposedly fell in love with others. Other disappointments in love included Sophie Ørsted, the daughter of the physicist Hans Christian Ørsted and Louise Collin, the youngest daughter of his benefactor Jonas Collin. One of his stories, "The Nightingale", was written as an expression of his passion for Jenny Lind and became the inspiration for her nickname, the "Swedish Nightingale". Andersen was often shy around women and had extreme difficulty in proposing to Lind. When Lind was boarding a train to go to an opera concert, Andersen gave Lind a letter of proposal. Her feelings towards him were not the same; she saw him as a brother, writing to him in 1844: "farewell ... God bless and protect my brother is the sincere wish of his affectionate sister, Jenny". According to Anne Klara Bom and Anya Aarenstrup from the H. C. Andersen Centre of University of Southern Denmark, "To conclude, it is correct to point to the very ambivalent (and also very traumatic) elements in Andersen's emotional life concerning the sexual sphere, but it is decidedly just as wrong to describe him as homosexual and maintain that he had physical relationships with men. He did not. Indeed that would have been entirely contrary to his moral and religious ideas, aspects that are quite outside the field of vision of Wullschlager and her like." 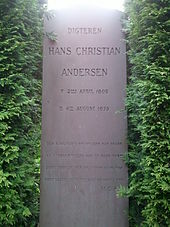 Andersen's gravestone at Assistens Cemetery in the Nørrebro district of Copenhagen. He died on 4 August 1875, in a house called Rolighed (literally: calmness), near Copenhagen, the home of his close friends, the banker Moritz Melchior and his wife. Shortly before his death, Andersen had consulted a composer about the music for his funeral, saying: "Most of the people who will walk after me will be children, so make the beat keep time with little steps." His body was interred in the Assistens Kirkegård in the Nørrebro area of Copenhagen.